We’d love your help. Let us know what’s wrong with this preview of Chicken Soup for the Christian Soul by Jack Canfield. To ask other readers questions about Chicken Soup for the Christian Soul, please sign up. This is not my typical kind of book. I usually go for the supernatural stuff, but these books were part of Amazon's "Daily Deal" at a great price do I decided to go for it. I loved these stories, they were heartwarming and taught me some valuable lessons. I bought another Chicken Soup book that I'm looking forward to reading next. This book is a set of short stories best for a bed time read. This book is nothing about religion but more about application of Christian values to an everyday life. The stories belong to different topics such as hope, miracles and death. And a few stories are even life changing. They will surely change your perspective towards the things in life. Sure a must read for every Christian. Wonderful book! Still read it from time to time! When I need to get closer to my faith this book really helped. Loved the stories, however most of them rarely had anything to do with Christianity in itself. But all together, great stories. I loved this! All of the short stories were so moving and touching. It was really great to see so many stories about other people who have a belief in God. My favorite section of the book was the 4th section on faith. That was good. A special book which will be your companion during tough times, the title says it all, this is a book for your soul! I have enjoyed the Chicken Soup for the Soul books and have a collection of them. The Christian ones impressed me and I am glad my husband added them to my collection. I love the stories in this. They made me laugh and cry. It warms the soul! 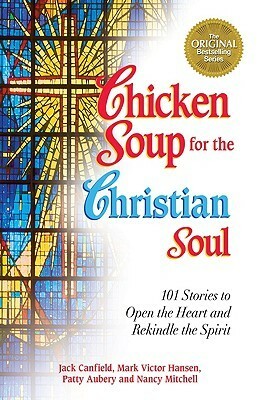 “Chicken Soup for the Christian Soul” is a collection of stories from different authors. These  stories will deepen your faith, open your heart and re-kindle your spirit. “Do what you ca I love chicken soup! Sedikit berbeda dengan edisi untuk remaja, buku yang secara khusus memang ditujukan bagi umat Kristen ini memasukkan unsur-unsur keKristenan di dalamnya. Kumpulan kisah-kisah menarik tentang hidup, pergulatan batin, konflik antar sesama, konflik pribadi, keluarga, lingkungan sosial, Gereja, dan juga relasi pribadi dengan Tuhan masih disajikan dengan format yang sama dengan "Chicken Soup for teenage soul". Akan tetapi nilai-nilai positif yang disampaikan sudah lebih banyak untuk ditujukan pertumbu Sedikit berbeda dengan edisi untuk remaja, buku yang secara khusus memang ditujukan bagi umat Kristen ini memasukkan unsur-unsur keKristenan di dalamnya. The book was amazing... It had several heart-warming stories that everyone can connect to at a personal level. I also loved how the book explores several themes such as faith, love, overcoming obstacles, etc instead of just focusing on a single topic... The book is sure to leave a lasting impression on anyone who reads it, with its optimistic take on life. Kudos to all those who worked hard to present such a beautiful book to the whole world!! Not exactly my kind of book, mostly since I'm not the religious type. Still I found this book interesting! I got to see the live story of people with different religion and cultural backgrounds, how they solved their problems, be thankful for their graces, et cetera. These stories are comforting and heartwarming. To put simply, reading this book will 'keep your faith in humanity in check.' Thanks to my ex-girlfriend back then in high school for this gift. I still keep the copy until today. I can't imagine the time it takes to put one of these chicken soup for the soul books. There are many theme's, something for everyone and I have never really put a thought to actually reading one. This book was a gift from a friend and so I felt like it would honor our friendship to read the gift before passing it on to someone else. This was a wonderful book on faith, hardships, love and pure miracles of God. My own faith grows stronger with these tales and I found the pages quickly turning. I felt a lot of stories would have touched me more, if the writer hadn't made them so ridiculously over-sentimental. This wasn't true for all of them, but some of them, while the intention was clearly to have me in tears, instead just made me roll my eyes. A lot of them weren't particularly Christian - someone just happened to mention God at some point. They were largely very nice, and quite uplifting, but I don't feel they've really inspired me on my Christian walk, or anything. This book was great. Makes a great "bathroom" book. No matter your faith the stories will touch you one way or another. Some were very inspiring. Great work can't wait to pick up my next Chicken Soup book. This book always strengthen me when I feel lost in life. I learned some life stuffs through the contributors' experience. Some stories make me laugh, some stories start me to cry, some stories build regret in my heart, and some stories encourage me to re-think about my life. Short stories of Christian experiences. There were some Catholic ones too, but they all spoke or referenced God in the same kind of manner. It was okay. Some of the stories were funny but it wasn't my favorite book. I did like how they included some funny church stories from celebraties. I have read a lot of these books so it should be very entertaining. I liked the book overall its an easy reader and could relate to a few of the stories. Oui, je l'avoue, j'ai aimé ça. C'est de même.